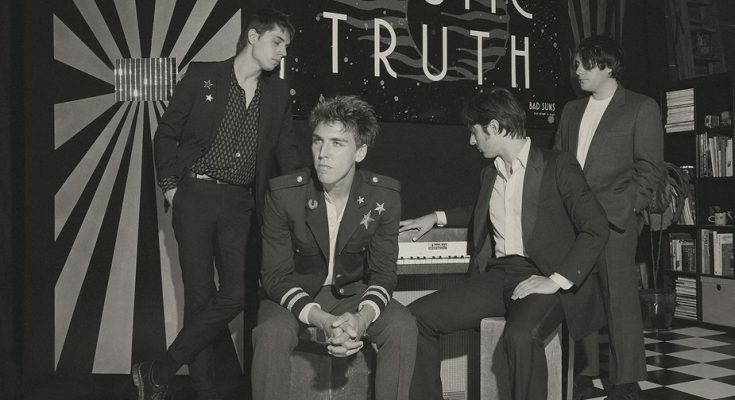 Somewhere between the bubbly pop of St. Lucia and the hard guitar riffs of The Arctic Monkeys lies the music of Bad Suns, an L.A. based quartet with a penchant for releasing crowd pleasing anthems like “Cardiac Arrest” and “Daft Pretty Boys.” Their newest album, ”Mystic Truth,” is their first since 2016, and provides us with more of what Bad Suns does best: pop-rock mashups that make us dance, hard. The lead track, “Away We Go,” was the first single off the album. The song is undeniably Bad Suns, effortlessly harnessing all the energy of Christo Bowman’s vocals and combining it with a catchy melody that makes the listener want to sing along. The song reflects the carefree attitude of most of their songs, with Bowman crooning about running away with a lover and dealing with the consequences later. In a way, that’s what the whole album is about- adopting a carefree attitude in times that may not seem so carefree at all, and finding beauty in the seemingly mundane. The standout track here is “Darkness Arrives (and Departs).” The song offers a very different vibe than many Bad Suns songs- it’s far from dance music. And that’s why it’s so good. It’s something new for them, a step away from their pop-rock roots that lands somewhere among the likes of pop-punk lite. As for the lyrics, Bad Suns is a band made up of young people all under the age of thirty, and the song reflects this. “The future’s in only our hands / Isn’t that mad?” questions Bowman as guitarist Ray Libby strums out a soft, hypnotic melody in the background. The eight other songs on the album hold to the classic Bad Suns style, relying heavily on anthemic vocals and melodies to highlight the overarching theme of youth and finding beauty in our world. “Starjumper” is an exception to the rule, a slowed down closing song at first sung over a soft melody that swells to a The 1975-esque ending of fading instrumental riffs. All things considered, the band’s third studio album is a success. It has everything a good indie album should, down to the moody black and white cover art. I predict a summer hit coming from this tracklist, and I can’t wait to hear it on the radio when that happens. Emma, or Em, is an advertising major with a soft spot for alternative music. Her favorite song changes almost daily, and she could name a million reasons why Spotify is the best music streaming service. Catch her binge watching Netflix documentaries or on, you guessed it, Spotify, finding new music for her playlist of the month.